In the Tigray Region of Ethiopia, community members share similar stories of struggling to find clean water, often walking 7 hours round-trip and still falling ill because the source of the water, despite the long walk, is unclean. 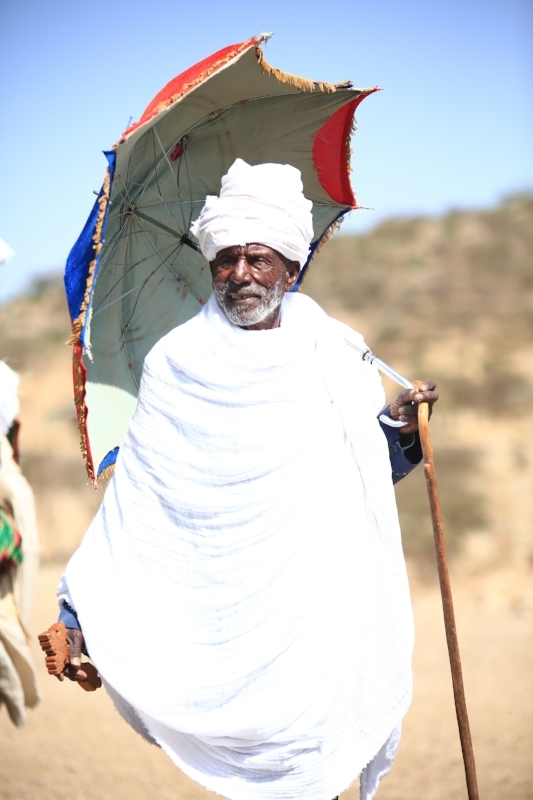 Abba Ashebir Hailemariam has lived in one of these communities for his 82 years of life, where he fathered three daughters and nine sons, and has remained deeply religious in the context of this predominantly Orthodox Christian culture. He has known the pain that comes with a lack of clean water, but has never lost faith. Every Sunday, his community attends a liturgy service for two hours in the morning. Immediately after the service, the community gathers under the shade of a tree on the church grounds to discuss the religious teachings and prayers. This is also the time when the Drop of Water (DOW) team meets with the community members, mobilizing them to be proactive agents of change through water, sanitation, and hygiene (WASH) best practices. One day, a DOW project officer was speaking of plans to provide Abba’s community with clean water for the first time. Abba could not believe what he was hearing; he was finally going to see his community have access to clean water. In awe, Abba turned to the project manager and asked, “My son, what is he saying? Is he saying that you are going to build a water well? Are we going to drink clean water in our village?” The member of DOW’s team was so touched, and he gladly assured Abba, “Yes, Father!” Abba became emotional and lifted his eyes to the clear, blue sky rejoicing, “Mariam Werida,” an Ethiopian Orthodox saying implying the source of all good things, redemption and happiness has come down from heaven. We visited Abba’s village again in February, where we were greeted with an extravagant celebration. After 82 years of faith, God chose to use Blood:Water’s partnership with DOW to answer Abba’s prayers, and he participated in the celebration of not one, but three, new sources of clean water in his village.